Two 78s in the early '50s and a 1989 rediscovery album don't add up to much of a recorded legacy. But Zuzu Bollin's contribution to the Texas blues legacy shouldn't be overlooked ? 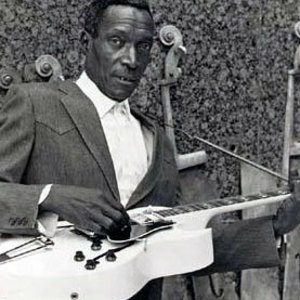 his T-Bone Walker-influenced sound typified postwar Lone Star blues guitar. Born A.D. Bollin, Zuzu listened to everyone from Blind Lemon Jefferson and Leroy Carr (on records) to Joe Turner and Count Basie. He picked up his nickname while in the band of Texan E.X. Born A.D. Bollin, Zuzu listened to everyone from Blind Lemon Jefferson and Leroy Carr (on records) to Joe Turner and Count Basie. He picked up his nickname while in the band of Texan E.X. Brooks; seems he had a sweet tooth for a brand of ginger snap cookies called ZuZus. Bollin formed his own combo in 1949, featuring young saxist David "Fathead" Newman. After a stint with Percy Mayfield's band, Bollin resumed playing around Dallas. In late 1951, he made his recording debut for Bob Sutton's Torch logo. Newman and saxist Leroy Cooper, both future members of Ray Charles' band, played on Bollin's "Why Don't You Eat Where You Slept Last Night" and "Headlight Blues." A Torch follow-up, "Stavin' Chain"/"Cry, Cry, Cry," found Bollin backed by Jimmy McCracklin's combo. No more recording ensued after that, though Bollin toured with bandleaders Ernie Fields and Joe Morris before chucking the music biz in 1964 to go into a more stable profession: dry cleaning. Bollin's 1987 rediscovery was the Dallas Blues Society's doing: they engineered a series of gigs and eventually a fine 1989 album, Texas Bluesman, that beautifully showcased Bollin's approach. Their efforts were barely in time ? Bollin died in 1990.